As Moodle is 10 years old today, I thought I would share some Moodly stuff! The 1st Moodle Research Conference is taking place at Heraklion, Crete on the 14-15 September, 2012. There are 54 Official Moodle Partners spread over 33 Countries. And according to Ohloh, Moodle has had 55,614 commits made by 319 contributors representing 1,030,183 lines of code – Yes, that is over 1 million. If I was a good graphic artist I would love to have made this an infographic, and I may try, but if there is one web-design role I cannot do is the graphics part! So if someone out there can do it, go for it! Some others things using 10, I am sure each list could be more than 10, but in keeping with 10th birthday just trying to have 10ish in lists! @moodledev – Automated information about Moodle development. 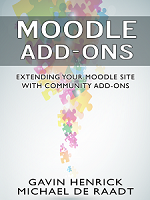 @moodleplugins – Info on recently released plugins for Moodle. @moodlethemes – Info on recently released themes for Moodle. Ok, so I ran out of lists of 10 things, what ones would you add? Some upcoming conferences and Moots! What about my wish list of ten new features? That would be more “could be about Moodle” no ? Very cool, included infographic, with credit to Piotr and links back to his blog and website.